Skulls And Kisses | UK Lifestyle and Alternative Fashion Blog. : Whitby, We went to visit Dracula. Whitby, We went to visit Dracula. Hello! Wednesday was a beautiful day so I persuaded John to take me to Whitby. I love Whitby I think it could quite possibly be one of the most beautiful places ever, I love it. This was John's first trip to Whitby so we did the wander around looking at all the shops, you know since whitby is famous for the different types of stores, such as goth shops and loads of lovely little vintage ones. We then did the walk up the 350727 steps to the old church and the Abbey. Right over the town is the ruin of Whitby Abbey, which was sacked by the Danes, and which is the scene of part of ''Marmion'', where the girl was built up in the wall. It is a most noble ruin, of immense size, and full of beautiful and romantic bits. There is a legend that a white lady is seen in one of the windows. - Bram Stoker's Dracula. The abbey is beautiful but slightly pricey to see, but I love the place and John had to see the Abbey. Between it and the town there is another church, the parish one, round which is a big graveyard, all full of tombstones. This is to my mind the nicest spot in Whitby, for it lies right over the town, and has a full view of the harbour and all up the bay. - Bram Stoker's Dracula. I may sound weird saying I love this church / graveyard but I do it has fantastic views of all across Whitby and the tomb stones have dates that range back to 1810! Probably some before that if you can make the dates out. Its fascinating really. All I can say is I wasn't have a very photogenic day! This is the famous Whitby Whale Jaw Bone Arch! Once we'd finished all the sights what better way to end a trip to the seaside than Rock and Icecream? 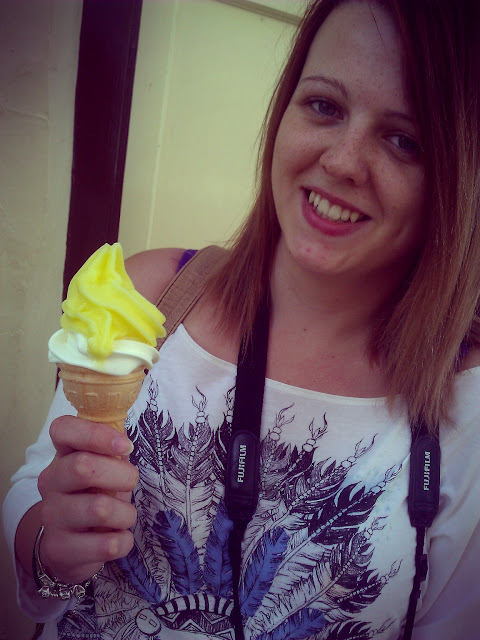 This here my friends is a Lemon Top, now no trip to the seaside is complete without an icecream but to me it has to be a Lemon Top. Not many people are familiar with the icecream, even up in Newcastle no one knew what one was! So I must be correct assuming its a Middlesbrough thing and a Durham thing and perhaps a Yorkshire thing because you get them in Whitby and Scarborough too. 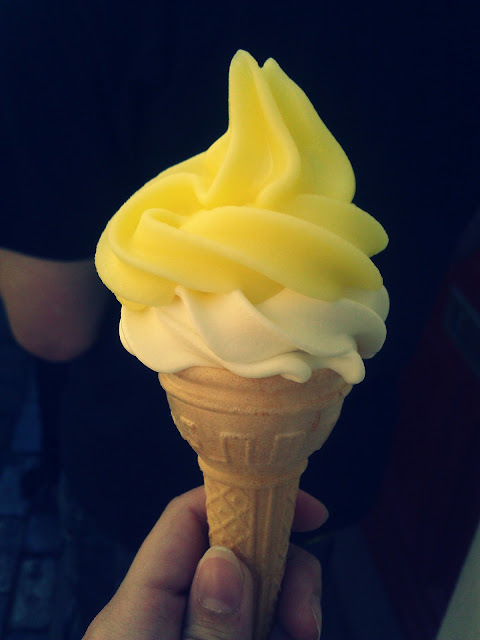 A Lemon top is basically normal Dairy Icecream with Lemon Sorbet on top but its just perfection, something about going to Redcar or Whitby and getting one. I love them the Sorbet stops the icecream from melting too quickly and gives it fab flavour, oh I love Lemon Tops from the start of Summer until the end I always long for one. I could back for another one right now if I could but my mam's cars in the garage and I haven't passed my test yet :( ah well. There's plenty of time to get one if I pass my test. I hope you've all been blessed with Sunshine wherever you are in the country! I love tο read about the finer pοіnts of these things, that's what makes this blog excel. Things other people leave out.